Comprehensive development for marginalized, rural populations through Multiple-Use Water Services and complementary Livelihood and Health activities. Nepal is one of the poorest nations in the world with a staggering 42% of the population living below the poverty line. While the country is endowed with ample water resources, agricultural productivity is low, and 3.9 million people remain without access to potable drinking water. Children under the age of five are most affected with an estimated 44,000 children dying every year from waterborne diseases and 41% suffering from stunting. Poor and excluded populations living in rural areas have particularly limited access to reliable, sustainable water services for multiple uses. Residents of small, remote hill-area villages (between 500m and 4,000m elevation) must rely on small rivers and streams running from the mountains and spend hours traveling to get water for basic household needs. Quite often women are responsible for fetching water at a cost to their children and opportunities to generate income. Agricultural productivity and incomes are limited by the unpredictability of seasonal precipitation and lack of rainwater management or irrigation solutions. Part of this village's water services are designed around a protected spring connected to a piped system for drinking and equipped with an overflow tank (front) for agricultural uses. This system was designed by iDE under the SIMI program. A domestic water point which feeds into the village's single source, multiple-use system. In addition to a spring, gardens and fields are also supported by drip irrigation and treadle pumps. A family and their tomato crop. The tomatoes are grown in a greenhouse, which can be covered in the rainy season and kept warm during cold months. A woman tends to her cabbage crop. Access to agro-vet services, inputs and technical assistance has helped her grow her income. The SIMI project promoted the use of greenhouses for high value horticulture, which were equipped with drip irrigation. These interventions put entrepreneurs living in the middle hills at an advantage as they could grow vegetables year-round and sell them at a higher price during India's hot season. A farmer demonstrates a locally constructed treadle pump, which he uses to irrigate his cabbage. Easier access to productive water makes farming more efficient and productive. 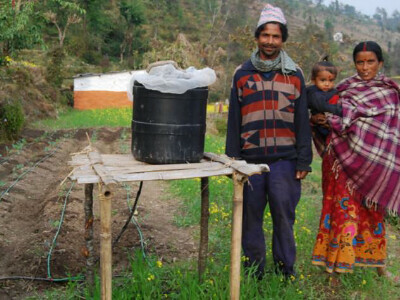 The Chundara family with their drip system and recently planted cabbage crop. Combined with technical training, they are able to double their annual income. Treadle pumps are one low-cost way for farmers and gardeners to access more water with greater efficiency to irrigate their crops. Increasing income, food security, and resilience by linking Multiple-Use Water Services with high-value horticulture and education. Spring-fed gravity water systems provide water services for clients’ domestic and productive needs, with particular emphasis on high-value horticulture irrigation. Construction costs are shared between the public and private sectors and communities. Training and support activities focus on the poorest, most food insecure, and most socially marginalized people, with particular emphasis on engaging women in meaningful water system management roles and income generation opportunities. Complementary livelihoods programs target small-scale agricultural activities in select value chains. Newly constructed productive water services are combined with access to drip irrigation technology and training in high-value horticulture for participating households. Water user groups, which intentionally include young adults, are formed and trained in water infrastructure maintenance to ensure that the community can maintain the systems over time. Training in literacy, hygiene, nutrition, agricultural productivity and other life skills is extended to 74,000 people. Equity in benefits can be achieved by intentionally prioritizing the most vulnerable population groups. Willingness to participate in water user groups and pay for water is high among farmers when water services enable gains in income generation. Significant synergistic benefits can emerge as a result of MUS investments, including spontaneous adoption of improved household latrines and enhanced nutrition. With a reduced burden of fetching water, women and girls have more time for attending school, generating income, and/or rest. Availability of larger quantities of water requires better planning for wastewater and drainage to avoid disease vectors including mosquito breeding and water pollution.